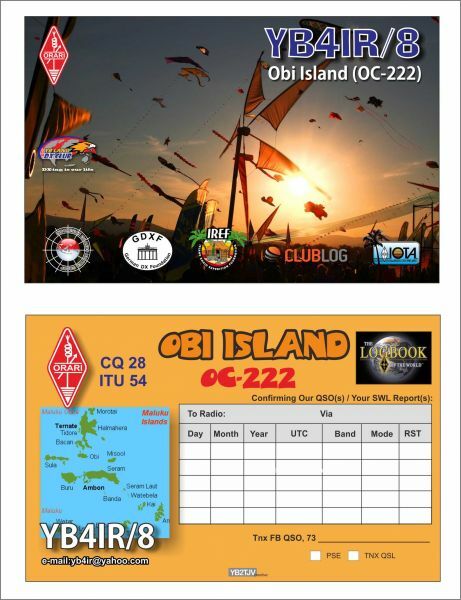 Imam, YB4IR will be active from Obi Island (IOTA OC-222) , Obi Islands 7-13 September 2014 as YB4IR/8. He will be active on 40-10m CW, SSB, RTTY. QSL via home call, direct, OQRS, LOTW. Obi Island is Island in Obi Islands ( Ombirah, Kepulauan Obi) in North Maluku province. Nearby islands Bisa, Gomumu, Obilatu, Tapat, Tobalai. Obis have many unexploreed caves. RSGB IOTA reference- IOTA OC-222 Obi Islands.